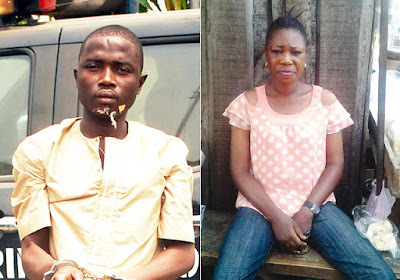 A Lagos driver, Shakiru Bello, who was arrested for allegedly killing his wife, Sherifat, said he cut her remains into pieces to escape the wrath of her father, Akeem Atanda, and to avoid being prosecuted for her death. in another uncompleted building on Moshalashi Street, Somolu. Punch reports that Sherifat and Shakiru, who were married for over nine years, were separated in July 2016. The victim, who lived on Daramola Street in the Ijora Badia area, had, however, last Monday reportedly demanded money for the upkeep of their three children. “After we separated, I secretly reconciled with her and we started meeting. On the average, I gave her N15,000 in a week. On that Monday, she called me that she needed money and we agreed to meet.“I gave her N10,000 that evening. She later begged me to accompany her to Lagos Island where her niece was admitted in a hospital. We took a motorcycle and were on the Third Mainland Bridge when a truck hit us from behind.“I took her to my house on Olaleye Street, Somolu, around 12am. I went out to get her balm and some drugs. Unfortunately, she died. I was afraid of her father, who didn’t want to see us together. Also, I couldn’t report to the police, so I decided to put her body in a sack and dispose of it. When it was not going into the sack, I cut off her arms, head, legs and other parts.”A police source, however, told Punch that the private parts of the victim were missing, saying the suspect might not be acting alone. They visited Akorede Street, Ijora Badia, where scores of sympathisers besieged the victim’s parents’ house. “He told her that he was given a medicine which both of them must rub on their bodies before making love. My sister tricked him and secretly told another relative, who informed my father. My father ordered us to go and pack her luggage. That was how they separated.“But four weeks ago, he called her on the telephone and said he wanted to see her, but my sister refused. I grabbed the phone from her and told him never to call her again.”The victim’s father, Akeem, said he was informed that his daughter was missing lastTuesday, adding that when he called the suspect, he denied knowing her whereabouts. “He told us he was at a traditional healing home in Ibadan where he was receiving treatment for an accident. When we got there, the owner of the home denied seeing him.“We went to his mother’s house and she said she was coming out to see us. We later noticed she had sneaked out through the back door and escaped.“The police in Lagos later asked us to come down; that they had arrested him. The Area Commander, Area B, told me that my daughter had been killed and her corpse cut into pieces.“The police should arrest all those involved in the killing. I want justice for her. It is unfortunate that my daughter has three children for him.”The state Police Public Relations Officer, SP Dolapo Badmos, said investigations were ongoing.